The Lockheed Ventura grew out of a British requirement for a larger, more powerful, replacement for same company's Hudson then in use with RAF Coastal Command. 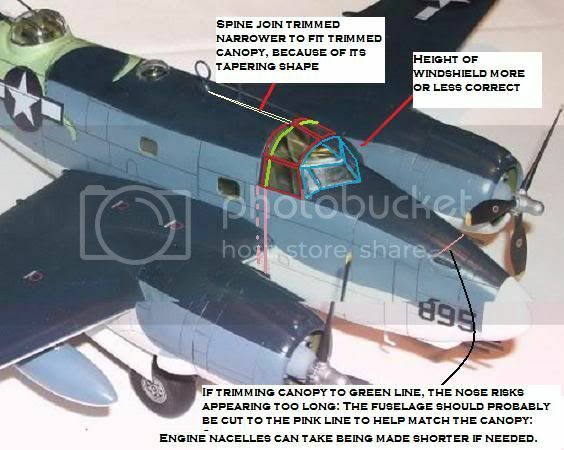 Based on the Model 18 Lodestar (the Hudson being converted from the smaller Model 14), the resulting aircraft shared a very similar layout, but was considerably more potent. Sadly, the RAF debut of the newly-named Ventura (meaning "Lucky Star", taken from the Spanish for good fortune), could hardly have been more ill-starred. Through a combination of bad judgement and sheer bad luck, the new aircraft suffered a severe mauling in a series of daylight raids by Bomber Command against heavily defended German targets, and the RAF rapidly grew disenchanted with the Ventura. Serving throughout the Pacific theatre of operations with both US and Commonwealth forces, and battling German U-Boats in the Atlantic and Mediterranean, the Ventura now proved as popular with its crews as it had been initially loathed by many in the RAF, and acquired a reputation as a hard-hitting, tough machine that could operate successfully in the most hostile combat environments. Its top speed of around 320 mph and good maneuverability allowed it to tackle Japanese fighters, and some Ventura's were fitted with radar and served as nightfighters with the USMC - ironically, it's chief problem in the role being its inability to slow down quickly enough once a target had been acquired. 2,493 Venturas were built, hundreds being surplus after WW2. Some were re-fitted for civil roles, while others continued to serve with various air forces - South Africa using its PV-1s until the late 1950s. The moulding is excellent, as you'd hope with a new tool mainstream kit. Produced in Korea (as proudly proclaimed in raised lettering on the kit's exterior(!) - sorry Revell, that's one "blast from the past" I could happily do without...), there's no sign of flash and just a couple of faint sink marks in my kit. Ejector pins have been well positioned to be as unobtrusive as possible. The surface finish comprises engraved panel lines, which some critics have deemed too heavy. Perhaps they are a tad so, but but we're hardly talking "Matchbox trenches" here, and what Revell have done will look just fine when painted and weathered. Overall, the impression is that everything is really crisp and not too complicated - in other words, it's a kit crying out to be built! The fit of all the main components in my kit can really be summed up in just one word - superb! The fuselage is designed with a separate nose and top section for the turret, a clear sign (along with an unused bomb-aimer's couch) that further versions are planned for the future. Multiple sections like this can be a recipe for trouble, but Revell's follow existing panel lines and fit very snuggly. The wings are supported by a short spar running through the fuselage and they are a perfect fit at the roots, while the full-span tail clips snuggly into a recess and clamps the rear fuselage together, with the vertical fins having the outer tips of the stabilizers moulded in place to make line-up simple. As an idea of just how easily the basic airframe clips together, I was able to dry-assemble it without even needing any tape. All in all, it looks set to be one of the easiest quarterscale "twins" to build that I've yet come across. The rest of the fuselage interior is basically bare except for some ribs and stringers that will be visible through the ventral gun position. This is a little disappointing, because the rear bulkhead in the cockpit has an open doorway, and you can see straight through to... nothing. The fact that the area is totally empty is emphasised by the crystal clear side windows and astrodome, so I imagine it won't be long before an aftermarket set is produced to fill the void. Similarly, the top turret is a bit basic, and superdetailers may wish to spruce it up a bit. Completing the interior are a boxed-in tailwheel well and a simple, but effective, bomb-bay housing racks for 2 x 500lb and 4 x 250lb bombs. The engines are moulded as one piece, which makes it sound as though they will be really crude, but in fact they are quite impressively detailed. Of course, aftermarket replacements will look better - Vector already produce a superb set of resin engine fronts and cowlings - but if they're painted carefully and have some wiring added, Revell's engines should more than satisfy most modellers. The propellers are also nicely moulded, but sadly not appropriate for wartime machines. To be honest, Revell have slightly shot themselves in the foot here, because the historical description in the instructions specifically mentions the paddle-bladed props used on the Ventura, and even the painting guide shows the correct type - but the kits parts seem to be based on the slim blades fitted to some restored machines. Happily, aftermarket replacements are already available from both True Details and Vector, and I think this is one upgrade really worth investing in as they are so prominent. The transparencies are excellent quality, being crystal clear with crisply defined frame lines. Revell provide a 12-page A-4 pamphlet with the construction broken down into no less than 51 stages. That does seem rather overkill for what is essentially quite a simple kit, and results in the drawings being rather densely packed and cluttered on the page. However, all the info you need is there, and assembly looks very straightforward. Colour matches for Revell's own paints are keyed to most details, and many involve mixing several paints to obtain the required colour, so many modellers will probably opt for their own preferred brand of model paints. 1. PV-1 Ventura "895" of VPB-150, Tinian, Mariana Islands, October 1944. 2. PV-1 Ventura "936" of VPB-135, Attu Island, the Aleutians, December 1944. The decals are very nicely printed with a silk finish and pin sharp registration on my sheet. Scheme #1 features the unit's distinctive octopus marking encircling the upper turret and a correction sheet is included with the items re-printed in a different green and a slightly different shape. Revell's Ventura is a great kit, being simple to assemble, and well-enough detailed to satisfy the majority of modellers - and, above all else, it's astonishing value for money. Just over £26 in the UK for a quarterscale kit of this size and quality is almost unheard of these days. If it had been released by one of the other "majors", the cost could easily have been three times Revell's asking price. Yes, some areas of the kit have clearly been designed to a tight budget, but I don't think that will worry most modellers and, of course, the beauty of the low price for the basic kit is that you can afford to splash out on a few luxury extras without fear of breaking the bank. 2012 is still young and who knows what might yet appear, but while Revell's Ventura might struggle to win the overall Kit Of The Year title, it could easily run away with the award for Best Value Kit Of The Year! Highly recommended. Highs: Low cost. Excellent fit. Adequate detail in general. Good quality decals. Lows: Inaccurate propellers. A few details simplified or missed. Verdict: Revell's Lockheed Ventura represents one of the best value for money kits I've seen in a long time. Easy to build and the perfect basis for extra detailing, it's equally suitable for relative beginners and experts alike. Rowan, Thank you VERY much for a helpful and informative review - AND - your list of accessories vendors is extremely valuable! I think your review is an example of HOW reviews should be done, although I miss a comment about the kit´s outline accuracy. I have noted that reviewers unfortunately constantly excludes this aspect which I regard as vital information to us modelers. Keep up the good work! - Harry B.
I have been given the kit as an exchange for my Special Hobby Barracuda which I no longer wanted, and it is a very impressive kit. There is a serious issue with the main canopy I describe here: LINK The cowlings are actually not that bad, and the easy to get Vector conversion takes care of any issue I would expect. The D-mold lower front fuselage is much harder to get, but is probably worthwhile. The lower rear fuselage corner radiuses seemed too square to me as well, but being low-situated this is not as big a deal. To me the main canopy is actually a bigger issue: If you look at the small fuselage window behind its main canopy side window, that portion and the small window are roughly in the same ballpark in length on the real aircraft: The kit main canopy side window, on the other hand, is much longer than the small fuselage window... I think that by trimming a fairly big -near 2 mm- amount from the entire rear edge of the cockpit canopy, this might restore the correct canopy proportions vs its triangular front part, AND the small fuselage window behind it: The problem is that the whole canopy tapers, so its rear cross-section will now be too narrow to match the spine: I think "cheating" by trimming away some plastic between the fuselage halves in the front of the spine will help the fit for that issue. The nose now risks looking too long however, and also to get a better windscreen fit I think the entire fuselage should be "brought back" to match the shorter canopy, even if the nacelles themselves need a little trimming as well... The pink lines made below show what I mean about shortening the fuselage, the green lines show why shortening the canopy is worthwhile: One of the risks here is not the issue of canopy fit, but of the whole canopy starting to look too small overall (that exact thing happened when I tried to trim the height off the -unknowingly to me- too narrow Accurate Miniatures Avenger canopy [10 mm vs 11.6 mm actual at top frame], so as to make it look wider: That of course ended in the bin...: Fortunately the far better Hobby Boss Avenger kit is here now). 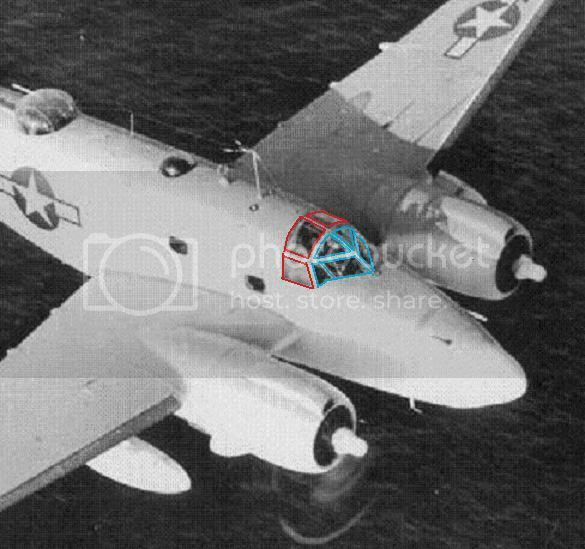 Considering the PV-1's modest price, I think the gamble here might be worth it, and also could turn out better... It is otherwise a very impressive kit overall, and at long last NOT a fighter-sized 1:48th scale subject for once... Gaston Edit: Disregard the pink line on the nose between the machine guns: That was from a previous concern that the nose looked a little narrow: Might still be valid but not the pink line I refer to.. G.
Some good news for us UK modelers, discount bookstore The Works are selling these at £19.99. I plan on grabbing one this week. Considering it's a relatively large 1/48 scale kit, it's a pretty good deal, warts and all. The warts aren't even that sever (IMHO) and there's aftermarket items available if you feel the need to correct them. I'm looking forward in seeing if they release and early version with nose windows.